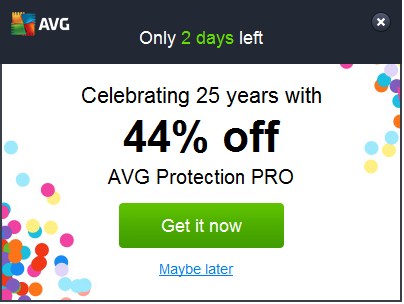 I use AVG because it's one of the best free anti-virus available, but the downside of using free software is that AVG does its best to sell services to me. Most days it'll ask me if I want to upgrade to a "Plus" version which is apparently infinitely better, doing things like actively tracking down hackers who write malware and giving them a hefty whack over the head with a camping mallet. Of course it isn't just AVG, it's unfair of me to focus just on them. CCleaner, which is one of my favourite pieces of software, also regularly suggests upgrading. The trouble is, certainly for both AVG and Ccleaner, is that they already do the thing that I want them to do (remove viruses and clean up my PC respectively), I don't need to pay for a stack of extra features that I'll never use. If I upgrade AVG, I'll get an enhanced firewall (not needed, my router comes with a fairly decent firewall), anti-spam (can't see that working with my gmail account), Data Safe (no idea but I assume it's a sort of cloud backup, which I already get with Google and Microsoft), and some other features, which can't be that fantastic, otherwise they'd mention them. Like a fool, I've just activated a 30 day trial of AVG Internet Security, which is AVG plus all the above stuff. I'll see in 29 days if I'm paying for a permanent version, or if I'm going back to the normal. Before I go, more new videos are up on my YouTube channel - latest one is episode 3 in my series Minecrafting About, where I go to get some sheep. Baa.